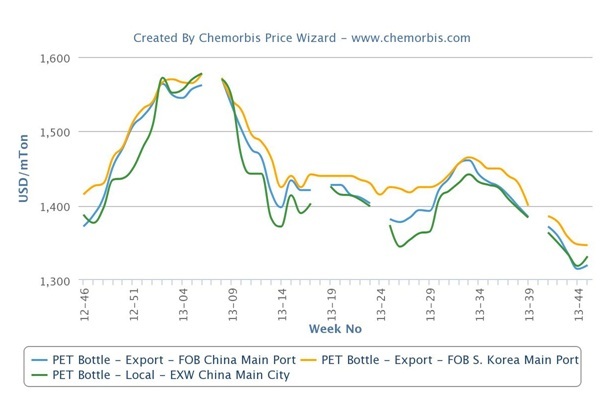 In Asia, PET prices have been declining since the middle of August in line with the weakening upstream costs and thinning demand as per the pricing service of ChemOrbis. 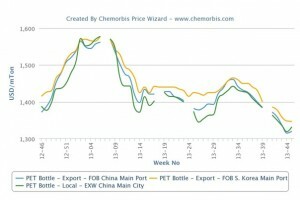 This past week, price ranges on FOB China basis tracked a stable to softer trend while export prices out of South Korea retained their previous week’s levels. Inside China, where PET producers and converters continue to run their plants at lower rates, prices slightly gained ground. In the upstream market, PET production costs are still $20-50/ton lower when compared with early October levels based on spot PTA, MEG and PX prices. However, when compared with the start of November, these production costs indicated mostly a steady trend for PTA and MEG while they recovered slightly, by around $10/ton, for PX. In China, more and more PET players started to question whether the PET market is close to the bottom or not. Steady to slightly firmer upstream costs encouraged domestic producers to lift up their prices.